My name is Sorina Durante. 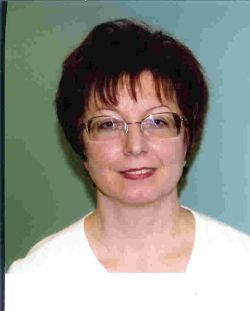 I am a Certified Massage Therapy Practitioner, Facial Rejuvenation & Body Sculpting Specialist, CranioSacral Therapy Practitioner, Reiki Master, Massage Cupping Practitioner, Cancer Massage Specialist and Breast Health Educator. I have a Bachelor of Science degree in Business. I am also a Certified Laser Therapy Practitioner. I am trained in the use of the THOR laser, FDA approved as non-invasive and safe, as well as the THOR protocols for Pain Relief. My training also includes the world-renowned Matrix Systems laser protocols for Smoking Cessation, Weight Management, Stress and Anxiety Management, Alcohol and Drug Addiction, and Cosmetic Rejuvenation Acutherapy. I attended London University in England, and T.Edison College in the USA, as well as the Academy of Natural Health Sciences, OCVTS, the North Jersey Massage Training Center, the Cayce/Reilly School of Massotherapy, Dr. Vodder’s School Manual Lymphatic Drainage training, the American Institute of Alternative Medicine, the Upledger Institute, and the Texas Beauty Institute training. I had training for Laser Therapy with THOR Laser of Britain, PanMedica Healthcare of the USA, and the Matrix Institute of Canada. I am a member of the American Bodywork and Massage Professionals (ABMP), the North American Association for Laser Therapy (NAALT), the Association of Certified Massage Cupping Practitioners (ACMCP), the Day Spa Association, and the National Association of Professional Women (NAPW). I work as a volunteer for the American Cancer Society (ACS CAN), cancer support groups and other organizations, as well as the community. 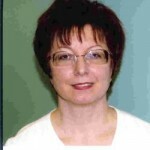 My specialized certifications include Dr. Kaufman’s Pain Neutralization Technique (PNT), Medical Massage, Myofascial Release, CranioSacral Therapy, Oncology and Hospice Massage, Mastectomy and Breast Surgery Massage, Manual Lymphatic Drainage, Massage Cupping, Lypossage, Facial Rejuvenation and Body Sculpting, Collagen and Elastin Infusion Therapy, Breast Health Education. I use some of the most advanced technologies and therapies in providing you with the highest level of care for optimal relaxation, rejuvenation and healing. Welcome and enjoy your treatments! Call 732-462-0909 for a free consultation or to set an appointment. Energy Balance Laser Therapy & Massage received USCA Best of Freehold Awards 2009 – 2015 for Massage, Pain Management, and Laser Rejuvenation, and is awarded Best of Freehold Hall of Fame award. 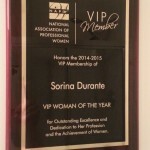 Sorina Durante received VIP Woman of the Year Award for Outstanding Excellence and Dedication.